Sorry my posts have been a little wonky the last few days, my queue finally ran out and that video post took me forever to edit and upload. Plus, student teaching has been exhausting. The packaging is a standard, foiled, coffee bag with a resealable fold down top. Honestly, I am kind of surprised by the plain packaging. I mean, you could very easily walk right past this and never notice that it was a limited, seasonal, flavor. Other than the Archer Farms label, there aren't any design elements. I kind of wish the bag was covered in little candy corns, or had an overall candy corn color scheme, but it doesn't. Then again, Archer Farms is a slightly frilly no-frills brand, so keeping it simple does make sense as far as keeping costs down. Once opened, I feared that Archer Farms pulled another fast one on me. This smells like normal coffee with a hint of vanilla. I couldn't detect any hint of candy corn or honey. Bah, I should have known better. This brand has burned me before with their fancy kettle chips, Archer Farms products are good, but they rarely live up to the tantalizing flavor name. Maybe it'll be more authentic when it's brewed? Sadly it wasn't. 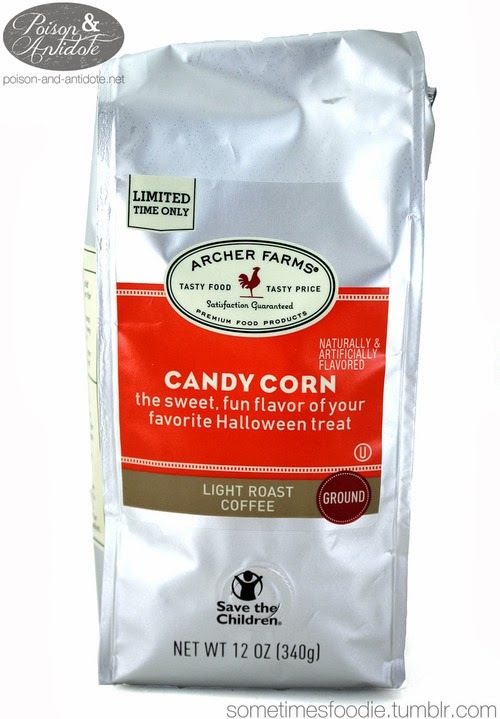 The brewed coffee has a mildly sweet vanilla taste, which is pleasant, but there is no way you'd ever mistake this for candy corn. I love the idea, but this product does not deliver.